Feel like royalty and wrap up in luxury with our Personalised No More Snags Bath Towel Set, custom embroidered with your monogram, initials or just stamp your name on it. A must-have bath piece for home or for an impressive gift combination! Whether its just for home use, wedding, home warming or just I love you...this is a gift from the heart. 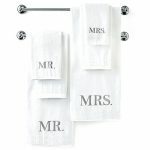 Add a personal touch to your bathroom's décor with the sophisticated Personalised No More Snags Bath Towel Set. Personalization ready for monogrammed initials, the soft towels make perfect gifts or a stylish additions to your bathroom. Our Personalised Face Cloths can add an elegant touch to any bathroom, and can add fun!. Each Personalised Face Cloth is is expertly embroidered with the text of your choice and in various colours to match your personal colour scheme. This is a great gift for Christmas and Birthdays! Possession is nine tenths of the law, so put your name on it! Our Personalised Bath Towel can add an elegant touch to any bathroom, and can add a fun, personalized style to your home! You’ll never again have to listen to your partner fight with you over which towel belongs to who when purchase our Personalised Bath Towels. Each Personalised Bath Towel White is expertly embroidered with the text of your choice and in various colours to match your personal colour scheme. Possession is nine tenths of the law, so put your name on it! Our Personalised bath sheet Platinum range can add an elegant touch to any bathroom, and can add a fun, personalized style to your home! You’ll never again have to listen to your partner fight with you over which towel belongs to who when purchase our Our Personalised bath sheet Platinum range. Each Our Personalised bath sheet Platinum range is is expertly embroidered with the text of your choice and in various colours to match your personal colour scheme. Let your creative side loose with Mr Right and Mrs Always Right to elegant monograms, this is a great gift for Christmas, Birthdays, Weddings, house warming, I love you, or simply don't touch my stuff. Our Personalised Bath Towel Colour Platinum Range can add an elegant touch to any bathroom, and can add a fun, personalized style to your home! Each Personalised Bath Towel is expertly embroidered with the text of your choice and in various colours to match your personal colour scheme. This is a great gift for Christmas, Birthdays, Weddings, house warming, I love you, or simply don't touch my stuff. Our Personalised hand Towel can add an elegant touch to any bathroom, and can add a fun, personalized style to your home! Each Personalised Hand Towel is expertly embroidered with the text of your choice and in various colours to match your personal colour scheme. Possession is nine tenths of the law, so put your name on it! Our Personalised Bath Towel can add an elegant touch to any bathroom, and can add a fun, personalized style to your home! You’ll never again have to listen to your partner fight with you over which towel belongs to who when purchase our Personalised Bath Towel. Each Personalised Bath Towel is expertly embroidered with the text of your choice and in various colours to match your personal colour scheme. Our Personalised Bath Sheet colours can add an elegant touch to any bathroom, and can add a fun, personalized style to your home! You’ll never again have to listen to your partner fight with you over which Bath Sheet belongs to who when purchase our Personalised Bath Sheet. Each Personalised Bath Sheet is is expertly embroidered with the text of your choice and in various colours to match your personal colour scheme. Let your creative side loose with Mr Right and Mrs Always Right to elegant monograms, this is a great gift for Christmas, Birthdays, Weddings, house warming, I love you, or simply don't touch my stuff. Possession is nine tenths of the law, so put your name on it! Our Personalised Hand Towel can add an elegant touch to any bathroom, and can add a fun, personalized style to your home! You’ll never again have to listen to your partner fight with you over which towel belongs to who when purchase our Personalised Hand Towels. Each Personalised Hand Towel is expertly embroidered with the text of your choice and in various colours to match your personal colour scheme. Possession is nine tenths of the law, so put your name on it! Our Personalised Guest Towel white can add an elegant touch to any bathroom, and can add a fun, personalized style to your home! You’ll never again have to listen to your partner fight with you over which towel belongs to who when purchase our Personalised Guest Towels. Each Personalised Guest Towel is expertly embroidered with the text of your choice and in various colours to match your personal colour scheme. Possession is nine tenths of the law, so put your name on it! 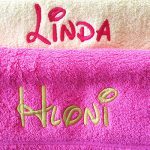 Our Personalised Guest Towel Colours, can add an elegant touch to any bathroom, and can add a fun, personalized style to your home! You’ll never again have to listen to your partner fight with you over which towel belongs to who when purchase our Personalised Guest Towel. Each Personalised Guest Towel is expertly embroidered with the text of your choice and in various colours to match your personal colour scheme. Possession is nine tenths of the law, so put your name on it! Our Personalised Bath Sheet White range can add an elegant touch to any bathroom, and can add a fun, personalized style to your home! You’ll never again have to listen to your partner fight with you over which Bath Sheet belongs to who when purchase our Our Personalised bath sheet. Each Personalised bath sheet White is is expertly embroidered with the text of your choice and in various colours to match your personal colour scheme. Let your creative side loose with Mr Right and Mrs Always Right to elegant monograms, this is a great gift for Christmas, Birthdays, Weddings, house warming, I love you, or simply don't touch my stuff. Possession is nine tenths of the law, so put your name on it! Our Personalised Bath Towel White can add an elegant touch to any bathroom, and can add a fun, personalized style to your home! 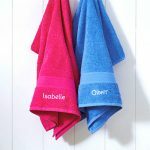 You’ll never again have to listen to your partner fight with you over which Bath Towel belongs to who when purchase our Personalised Bath Towels. Each Personalised Bath Towel is expertly embroidered with the text of your choice and in various colours to match your personal colour scheme. Possession is nine tenths of the law, so put your name on it! Our Personalised Face Cloth can add an elegant touch to any bathroom, and can add a fun, personalized style to your home! You’ll never again have to listen to your partner fight with you over which Face Cloth belongs to who when purchase our Personalised Face Cloth. Each Personalised Face Cloth is expertly embroidered with the text of your choice and in various colours to match your personal colour scheme. Our Personalised Bath Sheets can add an elegant touch to any bathroom, and can add a fun, personalized style to your home! You’ll never again have to listen to your partner fight with you over which Bath Sheet belongs to who when purchase our Personalised Bath Sheet. Each Personalised Bath Sheet is is expertly embroidered with the text of your choice and in various colours to match your personal colour scheme. Let your creative side loose with Mr Right and Mrs Always Right to elegant monograms, this is a great gift for Christmas, Birthdays, Weddings, house warming, I love you, or simply don't touch my stuff. Possession is nine tenths of the law, so put your name on it! Our Personalised Hand Towel White can add an elegant touch to any bathroom, and can add a fun, personalized style to your home! You’ll never again have to listen to your partner fight with you over which towel belongs to who when purchase our Personalised Hand Towel. Each Personalised Hand Towel is expertly embroidered with the text of your choice and in various colours to match your personal colour scheme. Possession is nine tenths of the law, so put your name on it! 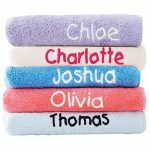 Our Personalised Twin Bath Towel Set can add an elegant touch to any bathroom, and can add a fun, personalized style to your home! You’ll never again have to listen to your partner fight with you over which towel belongs to who when purchase our Personalised Twin Bath Towel Set. 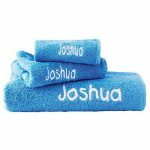 Each Personalised Twin Bath Towel Set is is expertly embroidered with the text of your choice and in various colours to match your personal colour scheme. Let your creative side loose with Mr Right and Mrs Always Right to elegant monograms, this is a great gift for Christmas, Birthdays, Weddings, house warming, I love you, or simply don't touch my stuff. 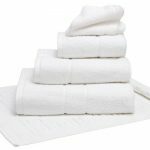 Each set consists of a two bath towels and two free face cloths in white. This personalised gym towel set is the perfect gift for that athletic person in your life! 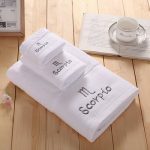 Beautifully personalized and very absorbent, these towel will be sure to please and dry beyond belief. 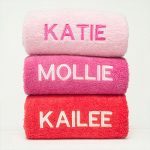 Personalised with machine embroidery onto a Premium 100% Cotton Towel that fits comfortably around the neck and shoulders and is the perfect size for carrying or zipping into your gym bag. The gym towel has a zip on the one side which closes a convenient pouch where you can store your valuable while you train. 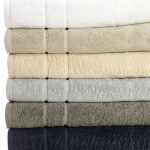 The towel is Eco and environmentally friendly super soft and absorbent, quick drying.